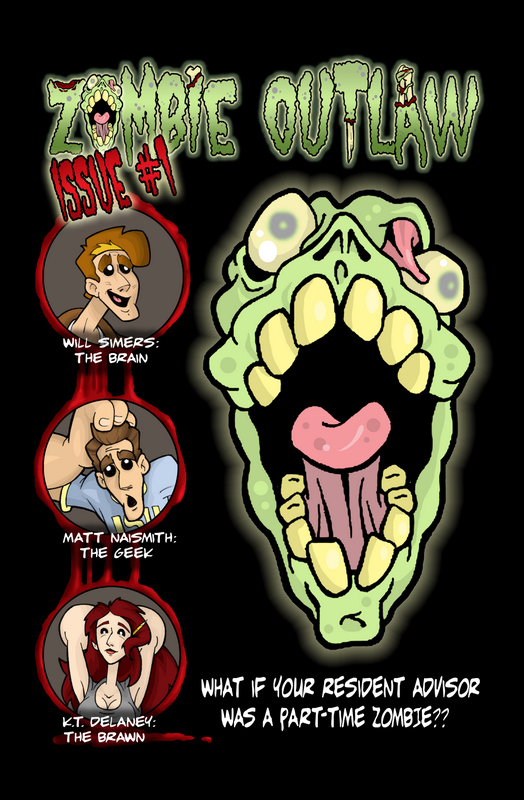 I recently had the pleasure to read ZOMBIE OUTLAW #1, but Brian Apodaca and B. Paul Jordan. The series basically follows Matt Naismith and his college resident advisor, Will Simers, as Will tries to help Matt get together with KT, his lab partner. But along the way, they have to unearth the tomb of the Zombie Outlaw, who was buried in Irvine State University back in 1972. As you can see from the cover, there is a lighthearted feel to this particular zombie story. It's almost a parody, I think, but I confess to not having bought into the zombie craze of the last few years (I have yet to read a single issue of THE WALKING DEAD ), and the art is indicative of that. Everyone has exaggerated proportions and expressions, to the point that portraying the girls with huge breasts and tiny waists isn't offensive (I think). There's also a lot of personality in each character that's conveyed by the art, and that's a real asset. Everyone just kind of pops out of the page. You know what they're supposed to be like just upon seeing them. Everything from their character designs to facial expressions is just tells you who they are. Seriously, just look at that cover. The personality embedded in each character is evident in the storytelling as well, with a lot of instances in which the characters break out of the confines of their panels. It's really just a fun, energetic book. The three-page sequence detailing the history of the Zombie Outlaw is particularly inspired. The book is not without its flaws. There's an average of about three panels a page, so it feels a little too quick and decompressed, and unfortunately, it feels as if there's too much dead space. For the most part, the layouts are straightforward, but there are some cases where the pacing is questionable. Sometimes a panel is given a larger space (subtly emphasizing its importance) for no discernible reason, which kind of gives off the feeling of emphasizing random words in a sentence for the sake of emphasis. There's a splash page near the end of the book when the Zombie Outlaw is about to come to life that comes right before a big dynamic moment. Why the calm before the storm was given the splash page instead of the storm itself, is beyond me. I'm assuming it has much to do with what Matt is standing in, but that wasn't particularly clear. Still though, these problems are workable. If Jordan just remembers to emphasize the actually important moments and not be reluctant to place more information on each page, it would improve by leaps and bounds! The book is full of energy and enthusiasm, and to be honest, I wouldn't mind an animated series. But don't take my word for it, folks. Check it out yourself! 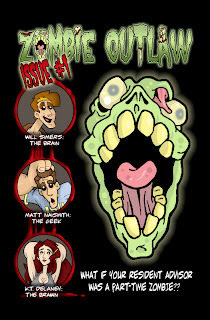 ZOMBIE OUTLAW can be bought through ComixPress. Also, visit the ZOMBIE OUTLAW website! Check out more Comics Cube! reviews here!